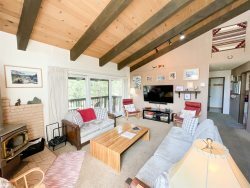 Above Standard, One Bedroom with Loft and two Bath condominium located walking distance to the Canyon Lodge Ski Lift Area in Mammoth Lakes. Sleeps up to 6. One Queen bed in the bedroom, one queen bed and one set of bunk beds in the loft, and No sofa sleeper in the living room. Three flat screen TV`s, VCR, 2 DVD`s (living room & loft), Living Room has a DVR, stereo/CD player. Wifi Internet Access in the unit. No land line phone in unit. (1050 sq ft). First floor is the Bedroom, Kitchen, Dining room, Living room, and one full bath. The second floor is the Loft and 2nd full bath. The loft is enclosed except for the stairwell area. This is an upstairs unit... You enter the unit from an enclosed hallway in the Chamonix B Building. There are two outside parking spaces available. Chamonix Recreation room with large screen TV, reading area, ping pong, foosball, and business center with fax, copier, computers w/ internet and laptop hook-up. Sauna, hydro spas, seasonal/summer swimming pool & BBQ area. Coin-operated laundry facilities located in the common area near the office. COMPLIMENTARY INTERNET and CABLE TV are provided, however NO REFUNDS will be given for connectivity problems or Internet failure. The unit has a gas fireplace that is not woodburning. TOT LICENSE 1968-CX40. Comfortable place walking distance to Canyon Lodge. Place was very clean. Our group had a wonderful time staying here! We loved being able to walk to the Canyon lift and it offered a great place to relax after a day on the slopes. We planned this trip last minute and hope we are able to make it back soon! Condo is very well equipped for a stay. Very nice location. Not far from resort, restaurants and lakes. Unfortunately during the summertime when its warmer during the day, there is no AC but still very relaxing a nice getaway." We had a great time at this airbnb! It was close walking distance to the shops/restaurants and lots of great hiking trails! It was easy to find and theres plenty of available parking. The pool and bbq area was great as well! Great location! 10 minute walk to Canyon Lodge which was perfect for our ski vacation. Spacious enough for our group, we took advantage of the very well stocked kitchen. Would definitely recommend! Good: Location, very clean, its up stairs, well equipped, warm, well kept, many beds, 2 showers,1 tub, Full kitchen. Went to mammoth for the first time with some friends and it was the perfect location - walking distance to the slopes. The condo was very cozy!